Paris is unique for many reasons, and so are its hotels. No other city has a luxury segment like the City of Light. Its Palace hotels, those with the official government distinction and those vying for it, are able to command rates unlike anywhere else. The last few years have seen some high-profile arrivals, including Shangri-La, Mandarin Oriental, and most recently The Peninsula Paris. In turn, a number of incumbents shuttered their doors to embark on significant renovations and will be due for their big reveal soon. Brand new hotels will continue to open their doors in the next few years as well, including – perhaps uncharacteristically – a few set within very contemporary skyscrapers. Here are eleven hotels on their way to Paris. Opening in the next few months is Amastan Paris, the first of the new Amastan brand. Promising a ‘curated home for the cultured traveller’, the 24-room hotel sits on a quiet street between rue Faubourg Saint-Honoré and the Avenue des Champs-Elysées. Rooms feature herringbone floors in bold petrol blue, a pattern that returns on the walls. A bar has outdoor seating in a private garden and there will be a project space for pop-up installations. 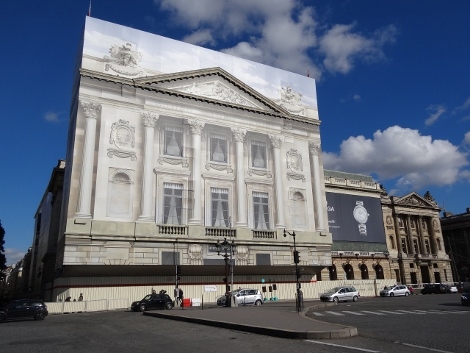 Also nearly there is the Renaissance Paris Republique, arriving in April in a converted 1970s building by Jean Jacques Fernier between Canal Saint Martin and Le Marais. The fifth Renaissance hotel in Paris, it will have 108 rooms and 13 suites, all of which are ‘designed as an artist’s studio’ by Didier Gomez. On Place Vendome, Hotel Ritz missed its March opening due to the fire that broke out in January (see news, January 19). Its grand return is now expected in June, nearly four years after it closed and €200m (£152m) in refurbishment later, with an exact date still to be confirmed. Hotel Ritz will have 71 rooms and 71 suites, with rates starting just north €1,000 (£914) a night. 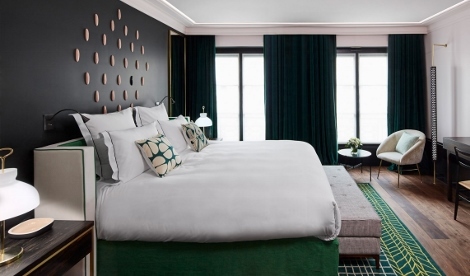 Opening in June and in the 1st arrondissement as well, Le Roch Hotel & Spa will bring 37 rooms by the hand of designer Sarah Lavoine. Rooms mix a ‘palette of sage, chartreuse, and milky green’, there will be a restaurant led by Chef Arnaud Faye, and a spa with indoor pool. 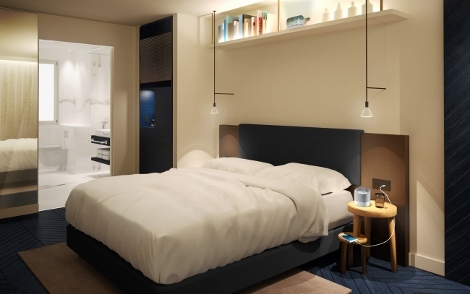 Following its international debut in Amsterdam (see news, February 20), The Hoxton Paris will be Hoxton Hotels’ second property outside the UK, due in the spring of 2017. 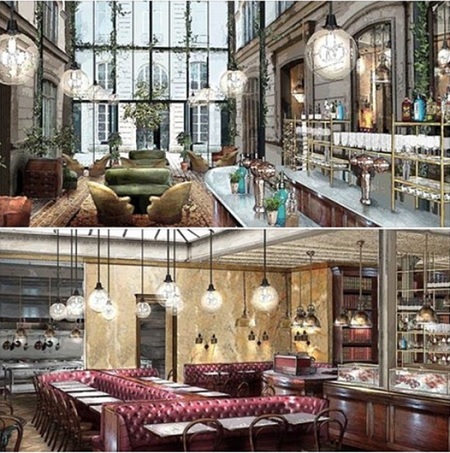 Set in the 2nd arrondissement in a 16th-century building constructed by Etienne Rivie, counsellor to King Louis XV, it will have 172 rooms, a restaurant, a speakeasy, and a café-come-tabac. Like Hotel Ritz, Hotel de Crillon – facing Place de la Concorde and next to the American Embassy – has been closed for several years. Reopening, under the management of Rosewood Hotels and Resorts, is expected in 2017. 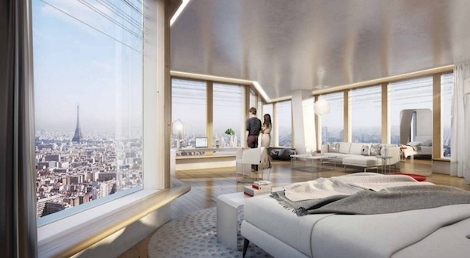 While details are kept very much under wraps, Karl Lagerfeld will design a select number of suites. 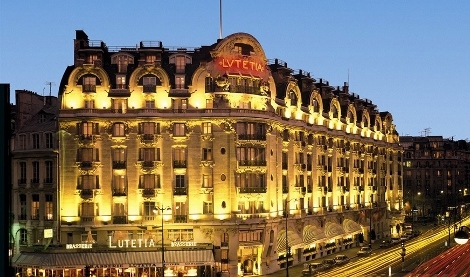 The last of the classic Parisian hotels to begin its transformation, Hotel Lutetia is on Boulevard Raspail on the city’s Left Bank. Its Art Nouveau façade will be restored, rooms, suites and public spaces are getting an overhaul, and a courtyard and spa with pool will be added. When complete, it will become the third property of The Set Hotels, alongside London’s Café Royal and Amsterdam’s Conservatorium Hotel. 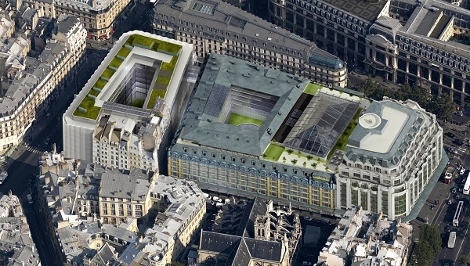 Having started with properties in Courchevel and the Maldives, Cheval Blanc Hotels – the brand from luxury conglomerate LVMH – will be building a flagship property in La Samaritaine, the legendary department store that has sat vacant along the Seine for a decade. Years of legal battle finally came to a conclusion in 2015, with plans for the mixed-use complex, including a 72-room hotel, now approved. When it comes to those contemporary skyscrapers, the first of three projects we’ll highlight is Hermitage Plaza. 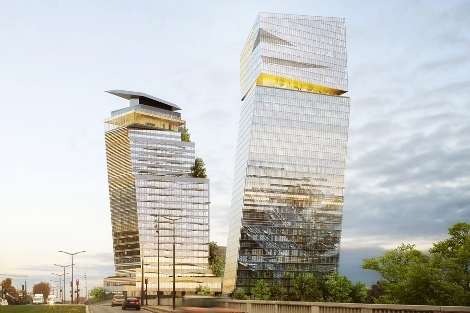 Designed by Foster+Partners, the two towers in the La Défense business area should incorporate a five-star hotel, with east-facing rooms offering views that encompass the Eiffel Tower and most of Paris. 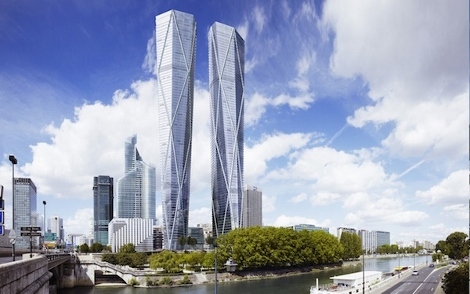 Second is another set of towers, this time from Jean Nouvel and in the 13th arrondissement, called ‘Tours Duo’. Leaning away from each other at 27 and 39 stories, the mixed-use project will combine offices, retail, restaurants, a sky bar, and a ‘high-rise luxury hotel’. Last is Tour Triangle, in Porte de Versailles and by Herzog & de Meuron. A 42-story, pyramid-shaped building, it will have a 120-room hotel between floors 12 and 17. 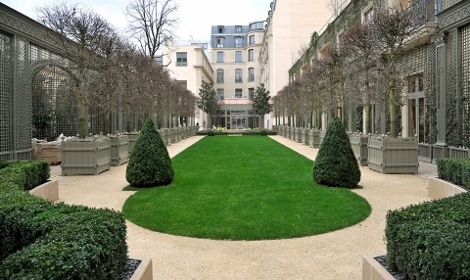 One name that we expected to have on this list was Andaz Paris, but rather than undergoing a conversion the Hotel du Louvre will remain and be part of Hyatt’s recently launched Unbound Collection (see news, March 2). 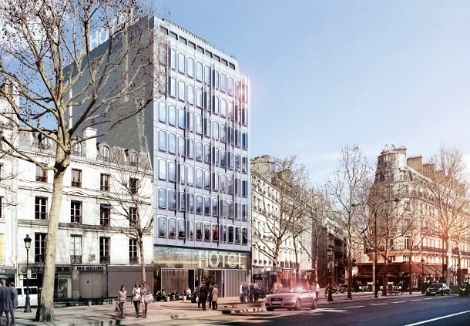 Other projects that are in the works include a luxury hotel by high-end grocer Fauchon and another Curio by Hilton hotel near Gare Montparnasse. Equally, having just announced its Barcelona hotel (see news, March 9), we know EDITION Hotels is still eyeing Paris for further European expansion.